Sommertime Oasis was born on Easter Sunday, 2008 at 2:00 in the afternoon. Although I had to miss Easter dinner, I am glad I was home to witness her arrival. 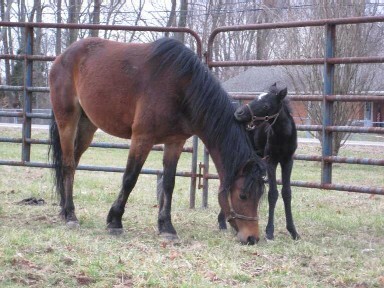 Sis is a very sweet filly that loves being around people. Since she was just a day old, she has formed a special bond with Jeff even though he is her "tormentor". Every day, Jeff goes into the stall with the babies and picks up their feet one at a time. We are big fans of our farrier, so want even the smallest client to stand properly for the farrier. Jeff also "checks their weight" by picking up the foals daily, until they are too heavy to lift. 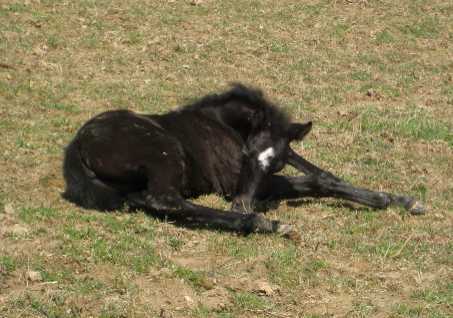 Sis weighed about 45 pounds when she was born, which is the typical size of our Welsh foals. 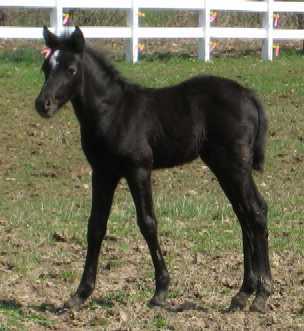 Sis is the first foal of a mare that is from MY first foal crop, Sommertime Opening Ceremony. I am very pleased with this filly and fully expect to repeat this cross in the future. New pictures showing Sis as a yearling will be coming soon, when the mud dries up!